FireFly Peanuts Toothbrush | Dr. Fresh, Llc. The toothbrush handle features the Peanuts gang–Charlie Brown, Lucy, and Woodstock–in the midst of one of their neighborhood baseball games. The same blinking technology that made Dr. Fresh’s FireFly toothbrush a best seller is incorporated into the handle. 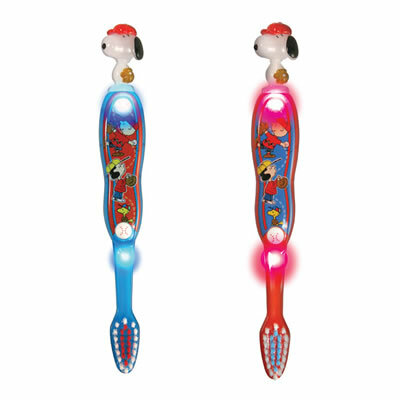 Kids simply press the button, to make it light up and flash for 60 seconds–the amount of time dentists say is needed to brush each arch. After the first row of teeth is done, kids simply press the timer button again and complete the other.